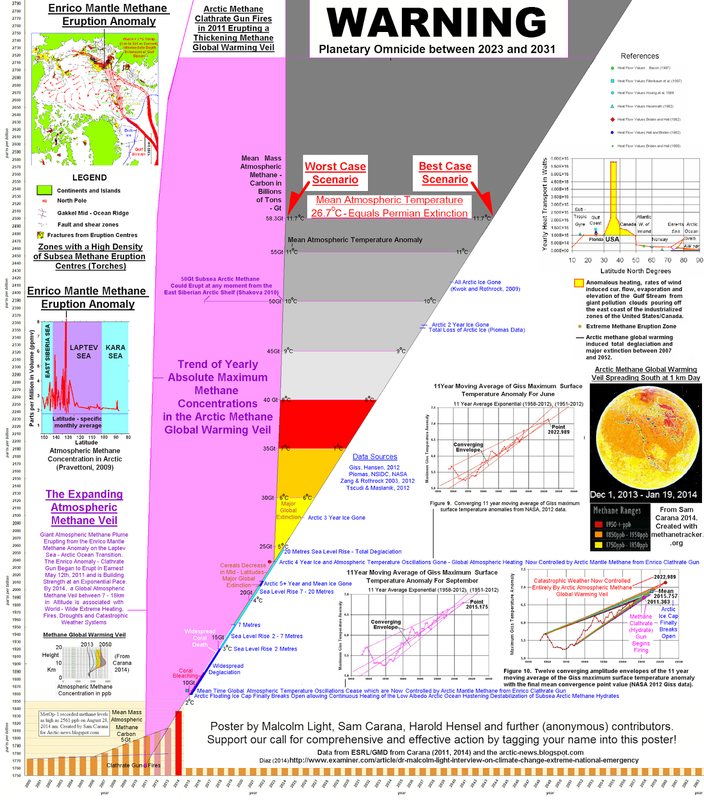 The timeline for human extinction as laid out in Sam Carana’s methane chart. This week, people who are following issues with ‘climate change’ were treated to numerous articles reporting that atmospheric levels of c02 seem to be fixed levels of 400 parts per million. But there was almost no reporting on what 400 ppm of carbon means to the atmosphere–or prospects for continued life on the planet. The potential guests I tried to round up on this topic (all staunch defenders of the mainstream climate pov, including government reps) all begged off. So (as a public service): these are the issues you should be bringing up every time politicians bring up ‘climate change’. Because if the climate has changed as much as these scientists say it has (and if anything, I think they’re being conservative) then there’s a word that should be in their vocabulary–Extinction. Or as Jimmy Buffett says, “we got a whole lot to drink about“.